This little diddy popped into our mailbox this morning. Apparently this G4 laptop was rather warm, and the owner left and came back to find it like this. 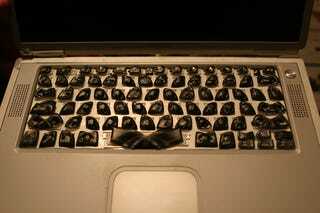 The geniuses at the Apple Genius Bar claimed the keys were melted from "the old hair dryer trick." Our observations: the keys are melted in a fairly uniform fashion, and if it was an internal heat that caused the keys to melt it wouldn't have melted so nicely. The picture shows that there was no heat focal point from inside the laptop. Also, the included story says this happened while the laptop was closed, but the screen appears to be in perfect condition. Vote below, hit the jump for the e-mail in its entirety and let the discussions begin in the comments section. Hi, I took this picture of my roommates g4 2 days ago. We play soccer together and in the morning before going to play he asked me to feel how hot his laptop was getting. It was extremely hot to the touch and I told him they were known for that. When we got back from playing he opened it up to find this (see pic). He took it to the "genius bar" and they told him Ahh the old hair dryer trick. I know for a fact that he didn't do that and I can't even imagine a hairdryer being able to do that. They basically PWN3D him.